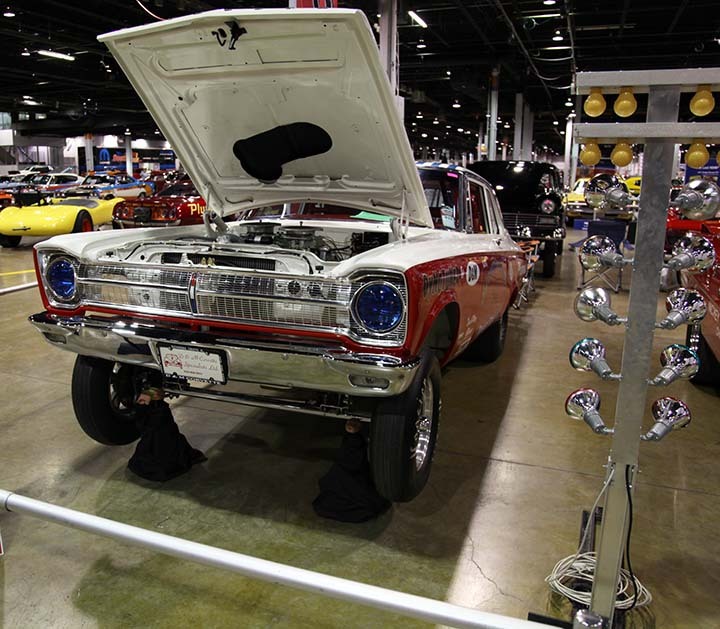 Home » Shows & Events » 2013 Muscle Car and Corvette Nationals -Gasser Madness! 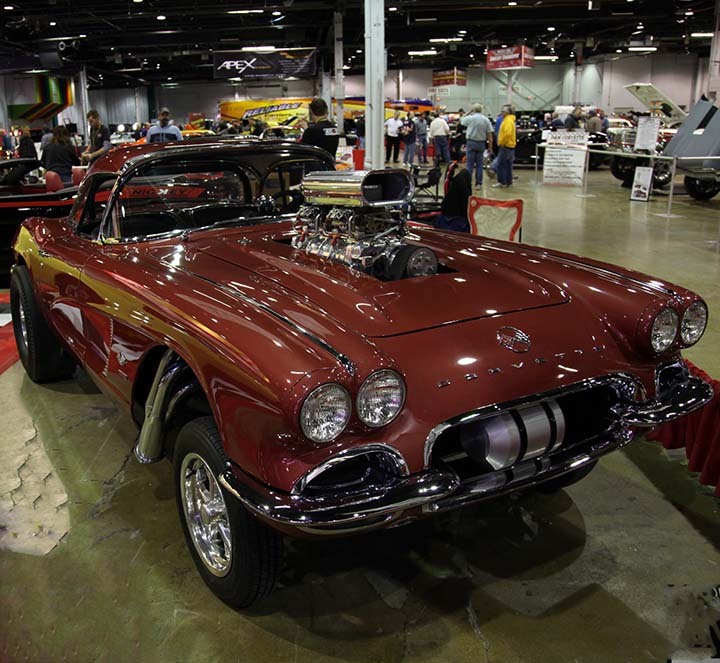 2013 Muscle Car and Corvette Nationals -Gasser Madness! Ya Just Gotta Ask…What’s The Deal With Gassers? In the very early years of the NHRA, gassers were nothing more than slightly modified gas powered sedans that could compete in five gas classes, determined by engine size and weight. In 1958, a gas class racer was basically a street coupe with no engine setback allowed. All “gassers” had working lights, wipers, starter, generator and all other street equipment. Fans and belts were optional, but radiators were required. Full exhaust systems, including mufflers, were required but could be unhooked for competition, but they had to remain on the car. Cars even had to be currently licensed for the street. 1957 Ford Fairlane, 2dr post built by D & M Corvette Specialists of Downers Grove, IL. Cars in the gas classes were required to have full “factory-type” upholstery but two buckets could replace the standard bench seat as long as both were fully upholstered. Customs were allowed as long as the car wasn’t chopped, channeled or sectioned a total of more than four inches. Cars had to have four stock fenders and the stock bumpers had to be in place. Full transmissions and four-wheel brakes were required. Quick-change rear-ends, locked differentials or ratchet-type rear-ends were permissible with safety hubs. The five gas classes, classified according to total car weight divided by total engine displacement cubic inches, had designations of A/G, B/G, C/G, D/G or E/G preceded by car number. Use of a supercharger moved you up one class. Another D & M creation…1965 Plymouth Belvedere A/FX. The FX classes pre-dated the first Funny Cars. By 1960, the rules changed significantly with engine setback of up to 10% permitted although most of the street equipment rules were still in force. The setback rule was introduced because there was nothing in the rules that required the original engine in the car to be used. If someone performed an engine swap in most any car chances were they would have to cut the firewall. The question then would be what is the “stock location” for a particular engine in a specific car? Introducing an engine setback limitation provided a level playing field for all competitors. By 1962 the rules that required full street equipment including mufflers, wipers, horns, generators, emergency brakes, license plates and registration were now gone. Roll-up side windows were no longer required and could be replaced by Plexiglas windows screwed to a window frame. Gassers were now real racecars and the performance of “blown” cars was getting pretty quick. Supercharged gassers were becoming the fastest full-bodied cars in drag racing. 1962 Corvette built in the style of John Masmanian by Nickey Chicago. Owner Dave VanAlystine. Heading through the mid to late 60s saw even more rules changes and racers were removing stock front suspensions and replacing them with simple straight axles, tiny front wheel/tire combinations and engines pushed even further back into the chassis. This effort to transfer more weight to the rear of the race car resulted in the golden age of gassers we seem to emulating now with this renewed interest in the nostalgic gasser. 1962 Ford Falcon, built by Midwest Street Rods, owned by Dan Ulreich, Plainfield, IL. More and more of these ungainly looking, brute force machines are finding their way into shows and events now even though their “streetability” is probably pretty suspect. But the pure “coolness” of a gasser can’t be beat. 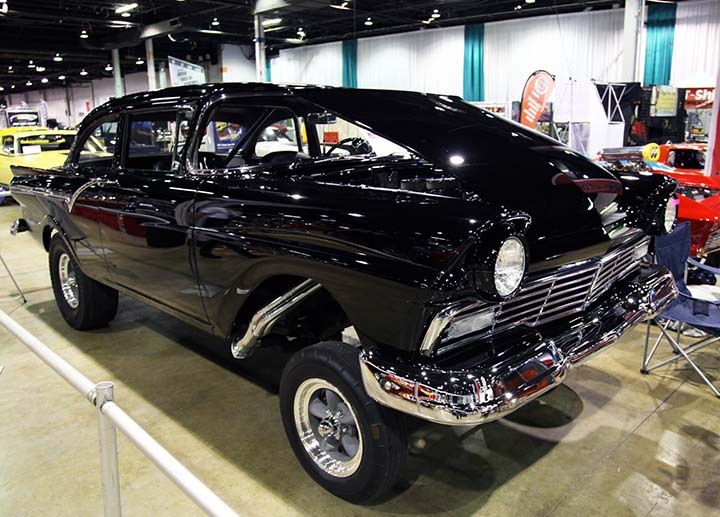 Rod and custom shops that in the past were working on street rods and what might be considered “show cars” are finding customers wanting the “gasser” image so we can expect to see more of these in the future.